In an A.R.G.U.S. weaponization center, Metallo screams out in pain. Mr. Oz arrives and promptly removes the kryptonite from Metallo's chest, killing the villain. In Metropolis, a crowd of people are verbally attacking a police officer after a high speed chase through the city resulted in destruction of a bridge. According to the officer, a criminal was trying to steal a van full of vaccines to cure smallpox in a third world country. The van currently sits in the harbor. If water gets into the vaccines, they'll be rendered useless. Superman recovers the van and makes his way off to deliver the vaccines. At the Daily Planet, Lois and Jon come into the office where they are greeted by Perry White, Jimmy Olsen, and Steve Lombard. Steve tries to impress Jon with his past sports achievements. Jon is not impressed. Clark returns from his mission when suddenly, notifications come in of prison riots, oil spills, poaching, and more. These events are all the work of Mr. Oz. From the shadows, Oz influenced people to resort to their base instincts of greed and violence. 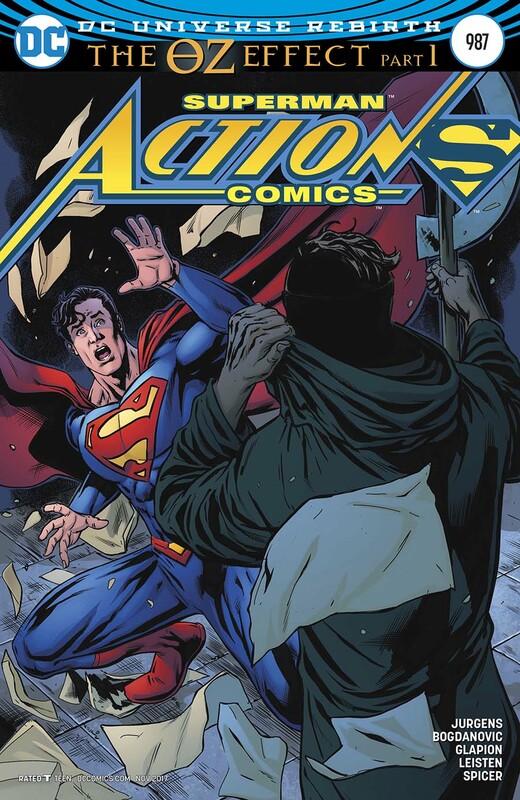 Superman flies off to save the day, but finds himself too late to save everyone. Oz finally reveals himself to Superman. Through Oz's power, the two are transported to the Fortress of Solitude where Oz reveals himself to be... Jor-El. Story - 3: I'm torn on this issue. On the one hand, there are plenty of things to like about it. It certainly feels like a Superman book, but I expect no less from Dan Jurgens. The man knows Superman. Everyone is written in character and it's nice seeing the Daily Planet gang back together. It's also great to know that Bibbo and the Ace O Clubs are still canon. I also think it's really sweet that Perry is Jon's godfather. It's small little touches like those that make me really love the Superman lore. Then there's the rest of the book. While it's not bad, it definitely feels like a setup issue. The only thing I'm left wondering is why the issue feels a bit weak. Jurgens is a strong writer and he's no stranger to event stories. I can't pinpoint it exactly, but something about the issue is slightly off in the setup department. I would also like to communicate my feelings of the Oz reveal. So far, I'm not buying it. Jor-El as a Superman villain? Get outta here. But that's just looking at this reveal at face value. I've got a feeling that this is a fake-out. There's no way that this is Oz's real identity. So for the time being, let's hope someone's trying to pull a fast one on Big Blue. Art - 3: Yikes! What happened, Bogdanovic? A lot of panels in this issue feel rushed and half-completed. There are faces that look a bit creepy and proportions that are sometimes off. I'm genuinely shocked, especially considering how impressed I was with Bogdanovic's work on New Super-Man. There are, however, some nice images of Superman doing stuff, and that's always a win in my book. Cover Art - 3: This cover is just all right. I don't mind lenticular covers, but oftentimes, they're rarely worth it. We had a few cool covers during the "Button" storyline over in Batman and The Flash, but this cover doesn't wow me. Especially not for the first issue in a story that a lot of fans have been waiting months for. Variant Cover Art - 4: I much prefer this cover. There's a sense of intrigue. Why's Superman so alarmed? Who could possibly be beneath the hood that made him react in such a way? 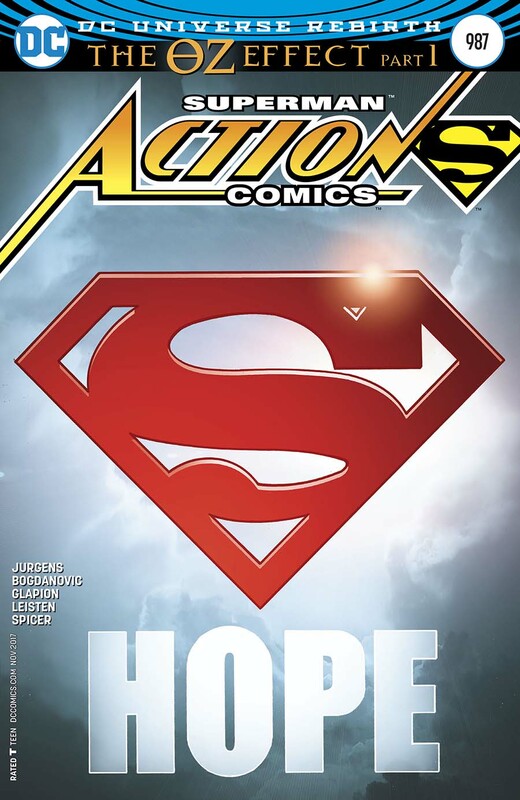 I wish this were the standard cover, but then DC couldn't do their lenticular cover gimmick.